I have had Moroccan food on my ‘to-do’ list for EVER!!! The problem is that I didn’t know where to start, dish-wise. Instead, I decided that I would have to make my own Ras el hanout blend first… and since I didn’t have some of the ingredients, I just kept putting it off. Not only did I actually make a first attempt at Ras el hanout, but I made my own harissa and a dish to actually use them in! Now I’m both excited by the outcome, and disappointed by my procrastination. Harissa - a spicy pepper condiment. Mmm. This spice blend seems to be fairly forgiving in that there are so many household variations that there is no one right way to do it. Sweet! I’m not going to talk about this much now, because I’d like to save it for another day. I will say that I’m determined to only buy whole spices from now on, because making spice blends is soo much fun! Again, forgiving and a little open to interpretation. Good! Mine came out a little darker than others I’ve seen, because the peppers I had on hand were a little bit darker. It was dead easy – soak the peppers, de-stem and de-seed them, whiz up in a food processor with a couple of spices and some garlic. I chose a simple spiced tomato dish featuring chick peas and dried apricots. All I can say is WOW! I really loved the combination of sweet and spicy (er, not spicy hot, but complex spicy). Topped with a bit of harissa, to add some heat, it was the perfect dish. I think this dish would be slow-cooked in a tagine, but I don’t have one. I chose a dutch oven that I could use to start the cooking on the stove top, and finish in the oven. Not your usual tomato sauce! On the stove, sauté onions and garlic in olive oil until soft. Mix the flour with a couple of tablespoons of the stock, to make a paste. Add the rest of the stock to the pot, as well as the honey and tomato paste. Stir until completely mixed. Add the flour/stock paste and stir until completely incorporated. Mix in the ras el hanout (or substituted spices), tumeric, ginger and salt and pepper. Stir in tomatoes, chickpeas, apricots and carrots. Make sure everything is covered in liquid – if not, add in more stock or water to cover. Lid, and put into oven for 1 hour. Stir occasionally, about once every half hour. While tagine is in the oven, prepare the couscous. In a heatproof dish, pour 1 1/2 cups of boiling water over 1 cup of couscous, cover with a towel or lid and let sit for about 5 minutes. The water should be gone, and the couscous should be fluffy. Fluff with a fork. 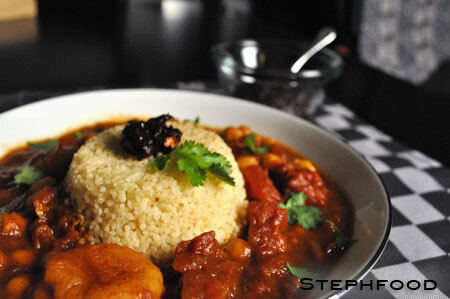 Serve tagine over couscous, topped with freshly chopped cilantro. 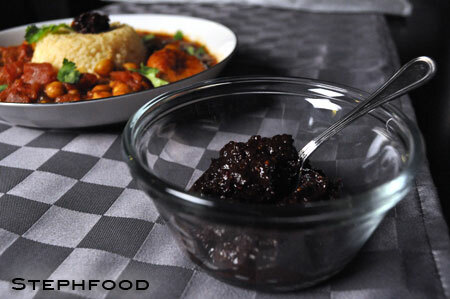 Serve some harissa on the side, to add to your dish as needed. I write about food and travel. My goal is to eventually eat my way around the world, and share it here.